ADJ will continue its celebration of 30 Years of Pure Lighting Excitement by demonstrating three innovative new products at this month’s InfoComm 2015 in Orlando, Florida. Visitors to the ADJ booth #6253 will get to see the AV6, Vizi Beam 5RX and COB Cannon Wash in action. 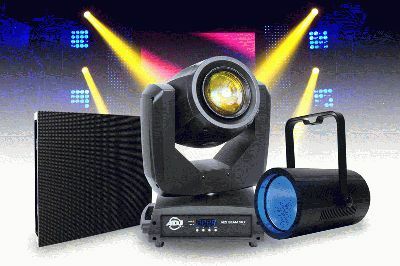 These products represent a wide range of quality, affordable and reliable solutions ADJ offers for event productions, nightclubs, churches and stages to help create the experience with special effects lighting. All three of these featured products are in stock and now shipping from ADJ. Marking an important development for ADJ, the AV6 is the company’s first ever modular LED screen system. Ideal for a range of applications, it’s reliable, affordable and highly effective, and users can easily link multiple panels together to create large screens of any shape or size. Offering high quality without the high price, ADJ has ensured that the AV6 makes impactful video panel solutions a possibility for those markets that would’ve previously found it impossible due to budget restrictions; providing small- to medium-sized churches, clubs, bars and other venues a chance to create more pure lighting excitement for their audiences. Visitors to Orlando will see the product’s 6mm pixel pitch, pixel density (27,777 pixel/m2) and low weight (23 lbs.). Make sure to see the AV6 in the flesh to see the quality for the remarkable value. ADJ will also display all accessories associated with the AV6 including hardware and software solutions. Building on the success of the Vizi Beam 5R, the brand new Vizi Beam 5RX utilizes motorized focus, allowing its beam to stay in focus even when moved to project over different distances. The fixture also offers an ultra-tight 5-degree beam angle as well as a much lower price point, enabling users to create powerful concise beam effects without spending big bucks. Visitors will be particularly impressed by the unit’s brightness, with the fast-moving new fixture being powered by the revolutionary Philips® Platinum 5R 189W discharge lamp, co-engineered by ADJ and Philips to offer a light output comparable to a regular 575W discharge lamp-powered fixture. With independent GOBO/color wheels and an 8-facet prism too, ADJ will show the array of vivid color hues and spellbinding effects that the Vizi Beam 5RX is capable of, making for some captivating demonstrations. The third product that will get centerstage attention at InfoComm 2015 is the COB Cannon Wash. This state of the art LED Par features a massive 80-degree wash with bold saturated colors produced from a 150W COB (Chip On Board) RGBA Quad LED engine. The COB LED offers a more saturated, even wash of intensely bright color. COB Cannon Wash has 64 built-in color macros, 7 DMX channel modes, 5 selectable dimming curves and flicker free operation for TV and film use. Its COB LEDs are also pixel mappable allowing for stunning visual effects. The fixture also comes with 40 and 50-degree lens kits to changes the beam angle. In addition to the AV6, Vizi Beam 5RX and COB Cannon Wash, ADJ will be displaying other lighting solutions perfect for the InfoComm demographic like the Inno Series Moving Heads, WiFLY wireless DMX battery powered Pars and linear fixtures, and other products with COB technology. With such a range of forward-thinking products on display, ADJ looks to steal the show at InfoComm 2015. Visitors heading to the ADJ booth will be able to experience these brand new lighting solutions first-hand, while the ADJ team remains close by to take questions and offer advice!